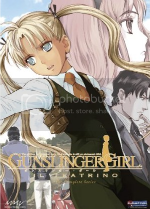 Gunslinger Girl – Il Teatrino is the recently released 13-episode sequel to the 2003 anime series. In Rome, Italy, a covert government operation takes in orphan girls on the verge of death, implants them with cybernetic technologies, and trains them to become the ultimate killing machine to take out the terrorist and bad guys that threaten their country. The combination of extreme violence being coldly perform by these cute little girls has become a trademark of this franchise. The Il Teatrino season focus on a particular story arc involving Pinocchio, a teenage male version of the gunslinger girls. An orphan himself, Pinocchio was adopted by a huge underground crime boss and was equally trained to be a cold-blooded killer, albeit without cybernetic implants. But the boy is an excellent assassin, and executes his adopted father’s orders flawlessly with almost little hesitation. Will the girls be able to take them down, or have they finally met their match with this male rival? First of all, I’ll start by saying that as a fan of pretty girl anime, I just loved the character designs and the character relationships in this series. The girls might be cold-blooded killers, but they are the damn cutest cold-blooded killers I’ve ever seen. I found myself particularly going gaga for the lead Henrietta and her simple-minded friend Rico. And the loving relationship between the girls and their adult trainers/partners/caregivers is as intriguing as it is disturbing and creepy. I was also a huge fan of the European setting and the way it’s portrayed within this series. Old fashion stone buildings are rendered with vivid detail and the constant theme of classic music perfectly sets the right mood. Europe is not a common setting for an anime series, and seeing it in this genre really gave off the impression of a Hollywood action film like The Bourne Identity or The International. In fact, I felt a lot of influence from those films in this series. With in the first episode and in various moments through out this season, a “shaky cam” technique is employed to heighten the excitement in action sequences. Hollywood film fans will be familiar with this technique in recent action films, and for live action movies, it is successful in giving the viewer the impression that they’re in the middle of all the action. But in an anime like this, it just looks really silly and stupid. It’s like you’re just holding a manga book in your hand and shaking it back and forth very quickly. This could be the reason why the animators appear to quickly abandon the idea after the first couple of episodes. But there are a few unconventional Hollywood-inspired cinematic techniques that did work. One scene shows Henrietta walking around the facility through the eyes of security camera video. It sounds like a cliche thing to do in movies, but I don’t recall seeing it done so much in anime. And the climatic battle in the final episode is shot with what looks like a huge over-saturation of colors. Which brings me to another aspect I loved about this show, it’s first Opening Production number. With a mellow song and a huge over-saturation of colors, a collection of real life still photos of Rome, school girls, guns, and blood stains flicker by very quickly. It’s very artistic and very unique for an anime series, and I found myself pretty bummed out when the visuals were replaced by a more traditional anime OP mid-way through the season. But ultimately, I found myself extremely bored by this season because of its slow plot pacing. There’s really not a lot of substance to the Pinocchio storyline, and unfortunately, the entire 13-episode run centers around this one story. The result is a lot of drag with almost no action or major plot development for episodes at a time. The eighth episode, “A Day in the Life of Claes,” is a purely pointless and boring filler episode that just follows around one of the minor characters. Why does a 13-episode series need a filler episode? The Good: Unique and beautiful OP, cute character designs, intriguing character relationships. The Bad: Horrible plot pacing, silly “shaky cam” technique. Final Verdict: When Gunslinger Girl – Il Teatrino hits its high notes, it hits it pretty hard. However, its slow and boring story pacing kills all excitement and enjoyment in this action series. Skip it. This entry was posted on Wednesday, August 26th, 2009 at 1:20 pm by Scott	.